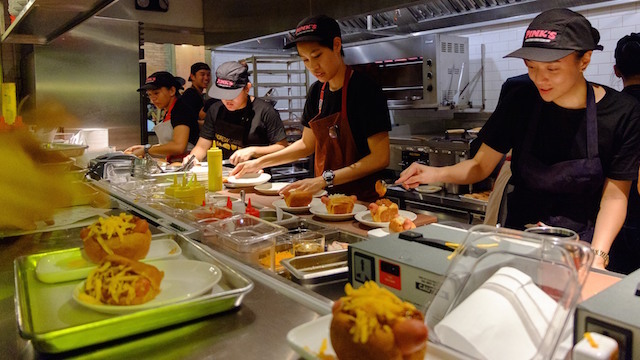 Los Angeles’ Pink’s Hotdog chain opens in the Philippines on June 10 at the Shangri-la Fort in Bonifacio Global City. Pink’s Manila is the chain’s first international branch.The Hollywood legend established in 1939 has partnered with Pink’s family and Wildflour & Farmacy Manila to enter the Philippine market. Owners Richard and Gloria Pink are in Manila to attend the grand opening at the ground floor of the newly opened hotel. Architect Lara Fernandez Barrios designed the “L.A. style biergarten” interiors based on Chef Walter Manzke’s concept for the Manila branch. The new store features a converted Volkswagen Combi housing Farmacy’s ice cream shop and soda fountain stand, as well as a bar that will be serving cocktails and mostly craft beers on draft. Tentative opening store hours will be from 11am to 2am, but are subject to change.